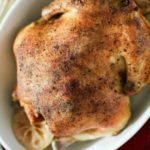 One of my all-time favorite ways to make a whole chicken is with rosemary, and this recipe doesn't disappoint! Combine all seasonings in a small bowl, reserving half of the rosemary. Baste the chicken with unsalted butter and olive oil and then cover with seasonings. Add half of the onion, lemons, and rosemary to the inner cavity of the chicken. Roll up three small lemon-sized balls of foil and place in the bottom of the slow cooker. Place half of lemons and onion with water into the bottom of the slow cooker. Add remaining rosemary to the top of the chicken. Keep this meal healthy by serving the chicken with salad or garlic flavored cauliflower rice.